What If Adam Was Not? Rom 5:12-14 GNB Sin came into the world through one man, and his sin brought death with it. As a result, death has spread to the whole human race because everyone has sinned. In his letter to the Roman Christians, the Apostle Paul posits his theology of sin's origin. The first man, the original man created by God, named Adam, was also the first sinner. But Adam's sin, disobeying God's command not to eat from the tree in middle of the garden, did not affect only him. His sin, according to Paul, was the original sin that put the stain of sin upon the entire human race. Act 17:26 GNB From one human being he created all races of people and made them live throughout the whole earth. He himself fixed beforehand the exact times and the limits of the places where they would live. Back now to Romans, where Paul tells us that sin entered the world through Adam, and that sin brought with it death, which has affected every human being after him. The devastating effect of Adam's sin is that everyone sins and consequently dies both spiritually and physically. But God had a plan, a solution to the problem of sin and death. Rom 5:18 GNB So then, as the one sin condemned all people, in the same way the one righteous act sets all people free and gives them life. Rom 5:21 GNB So then, just as sin ruled by means of death, so also God's grace rules by means of righteousness, leading us to eternal life through Jesus Christ our Lord. A perfect antidote to the effects of sin is revealed in the person and obedience of Jesus Christ. So a straightforward logical idea is posited: Adam sinned and therefore brought condemnation to all people, which put all people in need of a Savior, who is Jesus Christ. This is the essence of the Christian religion. This is Christianity's raison d'être. So here we are. If evolution is correct, then there was no Adam, no original human. If there was no Adam, then there could not have been an original sin. If there was no original sin, then there is no need for a Savior. Again, there seem to be only two ways around this logic. One would be to deny the veracity of evolution and assert the veracity of a literal interpretation of the biblical account of creation. 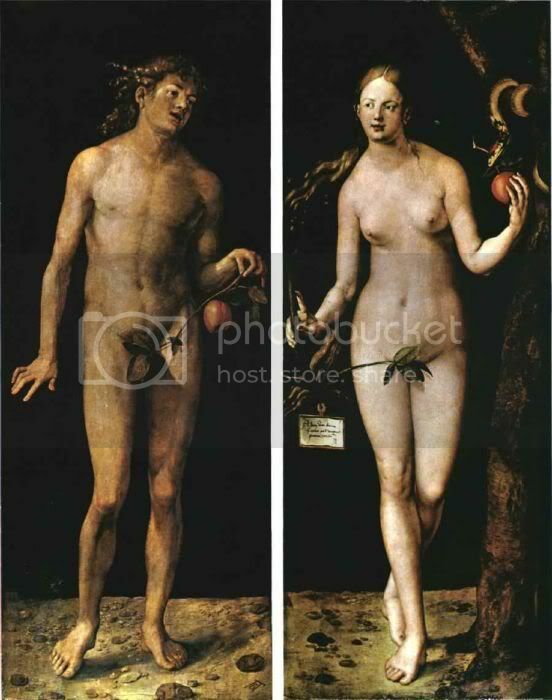 The second, for those many Christians who no longer claim to believe in a literal interpretation of the Genesis account, is to assert that Adam (and his original sin) is a mere metaphor for the sinful disobedience of early humanity, which somehow infected and affected the entire race. But the Bible asserts that the mechanism for the spread of sin throughout the race is the idea that we are all descended from the original sinner. If sin's entrance into the world was in fact more diffuse, how could it be certain that everyone would bear that stain? So does this argument hold water? Does the entire doctrine of Christian sin and redemption fall down if there was no Adam? Have millions been causelessly frightened by a problem that never existed? Have so many given their devout thanksgiving for naught? What do you think? Jesus was not created as a solution to man's sin. He was not created to bring salvation. In fact he was not creted, HE IS the Creator. One thing to remember is that sin is in our nature because we make our own decisions, God did not create pre-programmed robots, he created humans. He expects obedience but is up to us if we want to obey or not. "If there was no original sin, then there is no need for a Savior." That would be true except for the fact that there WAS in fact an original sin, therefore we now depend on God's salvation. Jesus has always existed, there is no beginning and no end, He is the Alpha and the Omega, there is no way a human being can even begin to comprehend the complexity of the power of God. Yet He decided to die for our sins and all we have to do now is truly believe in Him and depend on Him. The missing element in your article is FAITH. By the way if you ever feel like you could never believe this "stuff"
Read the story of Paul. not as a saint but as a person. I must have missed the part where I said that Jesus was created. I'm aware of the doctrine of Christ being eternal and the ultimate creator of all things. You say that there was in fact an original sin. You are exhibiting the circular reasoning I have such a problem with. You have decided to presuppose that everything the Bible says is true. What is that confidence based on? I mean rationally. You can quote biblical doctrine as fact all you want, but if you have nothing substantial to back that up, you might as well believe in Thor. Paul's conversion is often used as some sort of proof that Christianity is real, that he really did see Jesus, etc. Certainly Paul proposed a very powerful theology and his learning is obvious from his writings, but there have been many other people whose lives have been radically altered by a deeply moving experience of the supernatural. Look at Joseph Smith. He was killed for his beliefs. Do you believe he really saw an angel named Moroni? I think not. Don't worry about being anonymous. I know it's a hassle to join Blogger just to post on Blogger blogs. So how does evolution exclude the idea of a first man? Evolution posits small, gradual changes accumulating over large spans of time. There would not have been a clear delineation between a non-man and a first man. I still don't see how it excludes the possibility. I agree that evolution doesn't require a first man, it even makes it unlikely. But one could certainly imagine a lot of small variations followed by recombination of an incredibly fortuitous mutation leading to a clearly distinct first man. If this is *possible* then Adam as a real historical individual is certainly not excluded by evolution. OK, I'll concede that an evolutionarily derived Adam might be possible...barely. Evolution ultimately takes as much faith if not more than trusting in Christ and the Bible because no one was there to see the initial protoplasm that somehow managed to accumulate enough mutations to change into a multicellular organism and then into man and then before the man could die woman evolved for multiple humans to come about. There is an extreme amount of luck involved in the evolutionary process. Evolution is the only way scientists can get away with not believing in God so they hold on to it as tightly if not more so than Christians do their faith in Christ. Actually, evolution has been confirmed many times over in several different fields of science. It has nothing to do with faith. Also, evolution does not claim to explain the origin of life from non-life. (This is one of the main differences between science and religion. Science admits its ignorance, while religion claims to know that for which it has not a shred of evidence.) It deals only with the evolution of single celled organisms. Of course evolution has to do with faith. Faith that the universe is rational and follows a consistent set of rules, faith that the universe isn't an illusion or dream, faith in the scientific wisdom we have received from generations past, etc. You can't appeal to reason as the sole basis for your belief, since even the idea that reason leads to true conclusions must be justified, and it cannot justify itself. You have to posit a priori that certain kinds of justification will lead to conclusions that are probably true. That takes faith. Take the idea of induction. If we see something happen repeatedly, we conclude it is likely to happen that way again. But why should something happening in the past be justification for its liklihood in the future? Because its always worked that way? That's circular reasoning. You can't justify induction by induction, but you can't prove it by deduction either. Yet we take it on faith, as it were. And religion never claims anything "without a shred of evidence." Keep in mind that "because I said so" is a form of evidence, and one that we accept all the time in various contexts. All throughout scripture there is reference to evidence. Moses wrote down what God told him to. Evidence. We read it and believe it because of several reasons: people we trust conclude its reasonable, it matches up well with our experience of internal and external realities, we conclude that the people who wrote it down probably believed it, so based on a lot of evidence we conclude its true. Religious people are human, and humans rarely believe things without a shred of evidence. You have to deal with what kind of evidence you find acceptable, and then show that your categories are consistent with the ways you and other people actually come to know true things. To claim religion makes claims with no evidence is too simplistic and doesn't deal with what's really going on. Sadly, my coarse-grained and inartful arguments are vulnerable to your techniques. However, even though I do not have the time or the energy to close those gaps by more rigorous definitions of my words, I think you know what I mean by them. For example, while you may be correct in your assertion that a species of "faith" is required to believe literally anything, the "faith" needed to believe in evolution is wholly different in both quality and quantity from that which is required to believe in religion. Similarly, while my again inartful use of the term "shred of evidence" leaves me open to your correction, the type of evidence available to support evolution is very different to that which one would use to support a belief in one's religion. Yes, I do admit that I place my confidence in the kind of evidence that conforms to scientific standards. It is that type of evidence to which I refer. If you find another type of evidence to be compelling for you, then that is another matter. As always, thanks for keeping a lively discussion alive! What about Eve...that's a very good question. Even though she was the first one to take a bite, apparently God didn't lay the blame on her because as a woman she would be subject to Adam's authority. At least that would be the patriarchal, biblical view, I suspect. About faith, I'm trying to say more than I've succeeded in saying. I'm not just trying to nitpick. What all humans do is try to make sense of the broad range of experience. Use of the scientific method, or something like it, is ubiquitous and always has been. People have always used induction, and apparently its always worked. But humans, in general, want to know a bit more than that. *Why* does reason work so well? *Why* does induction appear to work? And ultimately, why is reason trustworth? We know there are plenty of things we *have* to believe for funcionality, and plenty more that we just insist on believing, that can't be or simply aren't proven by reason. So what is the proper place for reason? The materialist answers that all we have is what we perceive physically. They are forced to say reason is apparently functional because evolution apparently leads to functional tools. This is the functional theory developed by science. But to go so far as to claim it to be *true* requires that you believe a little bit more. It requires you to believe that the universe does in fact organize itself according to the kinds of rules and models we develop in science. It is certainly possible that science is merely a functional development in a tiny corner of a chaotic universe that obeys nothing like the laws of physics or biology. It could be that our tendency to find patterns is at play when really and truly the universe doesn't do that, or doesn't do it universally. So to believe evolution is *true* and in and of itself capable of bringing about life without guidance from any intelligence requires faith in a way much like religion, in things that cannot be verified or even addressed by science. I think that strict materialists are much more honest when they go the route of Nietzsche, and admit that if there is no God, there is no Truth either, and no Man. If they admit that the organizing of data and concepts into patterns is merely interesting and sometimes functional, but stop claiming it to be true, stop *believing* it, stop believing scientific knowledge to be True Knowledge, then I think they're in a position to say what they do approaches avoidance of faith, although not perfectly. But people who believe in Reason as the way to Truth, I think are in a much more clear and meaningful way, just substituting a new religion in for Christianity, albeit one that I don't think at the end of the day makes as much *sense*. They are still believing something they can't justify except that it seems to them to be the way it is. I think its worth noting, in favor of a biblical understanding that is not sexist, at least not in the way you interpret it, that there is nothing said of *subservience* until Genesis 3, and its part of the curse. Its only during the curse that God tells Eve "your desire shall be for your husband, and he shall rule over you" explicitly as part of the curse. This provides an *explanation* of patriarchy and even the struggles of women today, without providing an endorsement or suggestion that this is the way it is supposed to be.